Every few years, New York politicians jet off to Israel on the dime of the Jewish Community Relations Council (JCRC) to tour the region–including West Bank settlements–and bolster New York-Israel ties. The trips garner attention in the local press, but there is usually no visible opposition. On February 15, a group of New York City Council members, including members of the Progressive Caucus, will go on what has become a ritual trip. But what has changed this year is that activists are trying to make the free tour of Israel an issue. 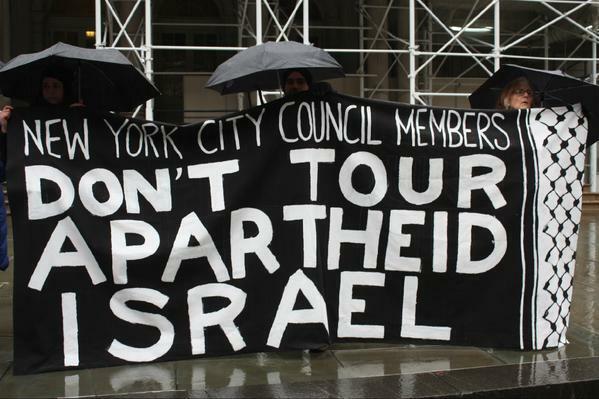 A vocal coalition has arisen to call on New York City Council members to spurn the free trip organized by the JCRC, an influential communal organization with close ties to government officials. 40 groups ranging from Jewish Voice for Peace to Al-Awda NY to the Committee Against Anti-Asian Violence have held press conferences on the steps of City Hall and sent letters to legislators to denounce the trip in an effort to generate public pressure. The activists say it is unseemly to tour Israel following the summer attack on the Gaza Strip, and have pointed out the history of partnership between the New York Police Department (NYPD) and Israeli security forces at a time of national ferment against police brutality, protest sparked in part by the death of Eric Garner, who was choked to death by a New York cop. A separate letter from the Jews Against Islamophobia Coalition urges City Council members to stay away from the trip because of the JCRC’s endorsement of anti-Muslim practices, like the NYPD’s surveillance of Muslim communities. The campaign is trying to politicize support for Israel–a heavy lift in New York (and the U.S.), but one that is gaining traction, particularly among Democrats and young people. “We think that it is inappropriate for people elected in New York City to act–for whatever level of government–to act as if part of their job is to defend Israel, when in fact there are many points of view in New York City on the Israeli occupation,” said Leslie Cagan, a member of Queers Against Israeli Apartheid, which is part of the coalition. The coalition of groups has, at the very least, shone a light on the trip. But it is unlikely they will have much of an impact on the City Council members who plan to go on the trip–including the progressive members that are a particular target of the demonstrators. Some activists involved in the campaign have met with a small number of City Council members to talk about the trip. But no legislator has heeded the call to not go. The City Council members who accepted the trip likely see no upside in being the first politician to spurn a trip to Israel. The movers and shakers in New York are fulsomely pro-Israel, a stance reinforced by an equally pro-Israel press. Donations from pro-Israel donors to local campaigns are also commonplace. Melissa Mark-Viverito, the Speaker of the City Council and the leader of the Israel trip, also blasted the disruption in a statement sent out later that day. “At a time when the Council was voting on a resolution commemorating the 70th anniversary of the liberation of Auschwitz, this outburst was offensive, outrageous and counter to the values of the City Council,” the statement read. Amin Husain, a member of the Direct Action Front, told me that the criticism of the disruption from fellow activists like Cagan was “nonsense” because they would have been called anti-Semitic anyway. Still, Husain said he understood that JVP’s and the Direct Action Front’s tactics may differ. Husain said he planned to continue organizing against the trip.